This s a great site! Please keep it up! Thank you for interesting and informative post! I really like this film! It is very amazing. I want to share with you good site for watching movies online http://putlockers.video/ . It is very simple in navigation and always helps me. There you can see at the main page the list of recent films with their appreciation, I think it is comfortably. Did you use this site? 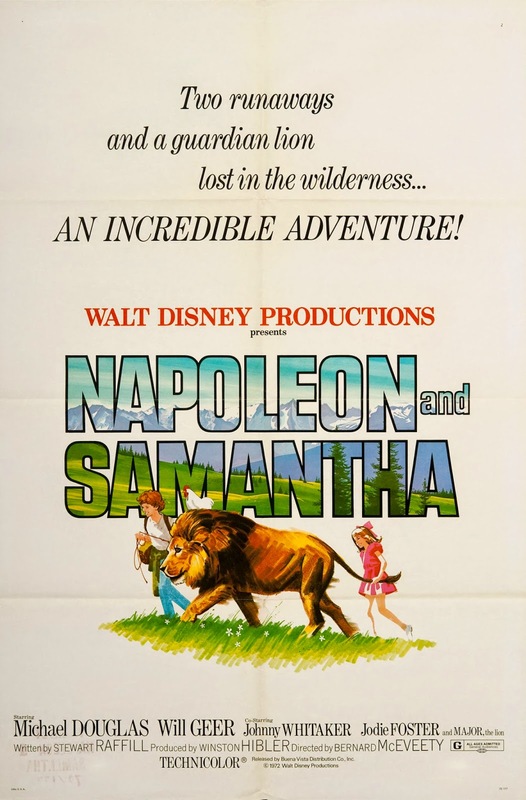 There were two lions used in making Napoleon and Samantha. They are easily told apart, because the main one - whose name really was Major - had no tuft at the end of his tail; the stunt lion, used for the more active shots, did. I worked closely with the real Major around the time the film was made... and he was the gentlest, tamest animal, who wouldn't harm a flea. I cannot imagine that it was he who injured poor Jodi, unless he was being overly playful. I have to believe it was the other lion. What kinda motorcycle is micheal riding? Anyone know? Hello, doing research on Disney live action films from the 1950s to the 1980s I stumbled onto you wonderful and charming blog. I find your reviews fantastic and informative. Disappointed to see you haven't continued for a couple years. I so hope you come back and restart the reviews. Looking forward with anticipation to them continuing. All the best. Fellow Disney fan. Jim S.
Thanks for the kind words! I have sadly lost time to maintain it, but it's still a passion of mine and I hope to resume someday. I truly hope you do!! I've enjoyed it immensely and would love to see you continue it again. But I understand life gets in the way. Best wishes and continued good fortune. Fellow Disney fan. Jim S.
With a streaming assistance, you are able to choose which shows and freefmovies.net that you want to watch anytime. By creating how-to videos, you will assist someone with a certain task and in return they will now know about your company. https://xmovies8free.com/watch/pusher-2012.html. Hello! I just found your blog and I think it's such a good idea! I can't wait to read all of the reviews, specially for the movies I didn't even know existed! I love everything Disney too, and was just wondering if you were ever planning to continue? This is such a great site man, you know your Disney 👍🏼. Hope you are doing well and hopefully we can read another one of your awesome posts soon. I've really enjoyed your site! I see it's been 4 years since you've done any more reviews, leaving Walt Disney Pictures in 1972 but please pick up where you left off ASAP! I'm extremely interested in reading more of your reviews of all their movies going into the rest of the 1970s & then the 80s! I particularly really appreciate learning about all of the lesser-known Disney pictures like a lot of the live-action movies & the True-Life Adventures! Great stuff, very comprehensive & entertaining! Thanks a lot from me!